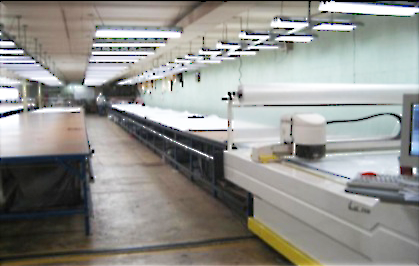 A laser cutting bridge system in the world of textiles is an industrial machine for cutting and engraving of textile materials (i.e. fabrics). It is formed by a galvanometric laser head and CO2 laser source that runs along a horizontal beam (the bridge) supported by two lateral columns and sometimes by central columns. 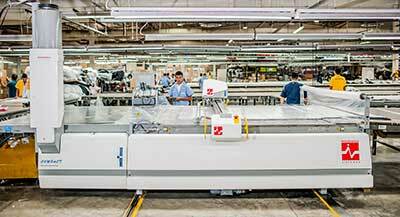 This system is placed over one or more embroidery machines, more frequently multi-head rather than single-head machines, cutting tables, roller devices, to cut out and/or engrave embroidered fabrics. A cut piece of cloth (the appliqué) is placed above the base material that is in the embroidery machine (having a first seam reference), is fixed and finally embroidered. More recently, the manual method of cutting has been replaced by the laser cutting technology, laser plotters first, and then by laser bridges. The laser ensures better accuracy compared to manual cutting. It allows users to imitate a jagged or irregular cut as if done by hand, with the advantage that the laser solders the borders of synthetic fiber, avoiding unpleasant unthreading. The combination “laser plus embroidery machine” offered by the laser bridge also avoids double work: no longer is it necessary to cut by hand after embroidering appliqués. The process also guarantees more accurate results, because the laser works on the same frame where the embroidery machine works avoiding positioning errors. The technology uses software that guides the cutting laser head along the bridge and the reflecting mirrors (moved by electromagnetic motors). This method provides a degree of accuracy and speed of cut much greater than traditional systems (1/100 mm instead of 1/10 mm). Computerized Laser Cutting System (right).